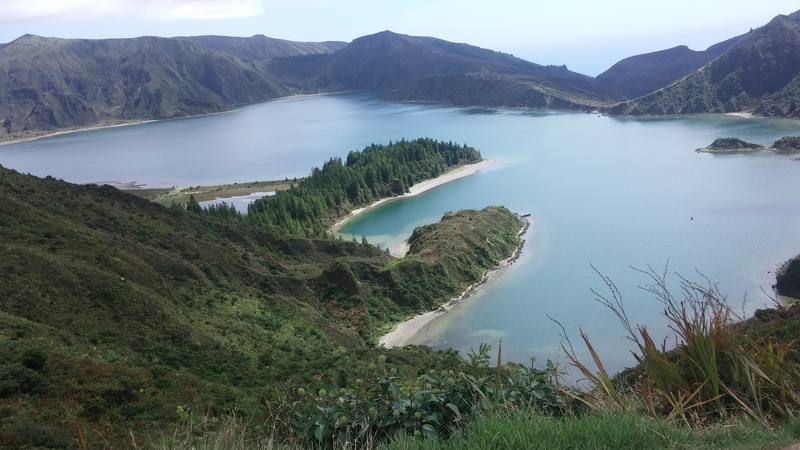 Our final excursions on the island of Sao Miguel were to two of its most famed natural attractions; Lagoa Fogo (Lagoon of Fire) and Sete Citades (pronounced Set Sid-atch) with its twin lakes of contrasting colour – one blue and one green. The drive up to Lagoa was spectacular – and high. It sits at around 1900 ft above sea level and is stunning. This volcanic crater is a protected nature reserve, and there are paths which you can take to venture down to the water’s edge and the sandy beaches, although we didn’t do this. It is so quiet up there….and breathtakingly beautiful. I actually became a bit tearful at how amazing this landscape is. On the way down, you can visit Caldeira Velha – a great spot for our picnic. Admission is 2 € each but the treat is a thermal waterfall and bathing pools to enjoy, amid lush vegetation. A hot spring feeds into a waterfall which heats the larger pool to a tepid temperature, while the smaller pool is heated by an immediate caldeira and is a wondrous hot bath. Incredibly relaxing!